Dinosaur Train was one of my children's favorite television shows when they were toddlers and if you have preschoolers in your life I'd highly recommend tuning in to watch this great animated television series from The Jim Henson Company on your local PBS station. In support of April being designated Autism Awareness Month, Dinosaur Train has teamed up with the Centers for Disease Control & Prevention's "Learn the Signs: Act Early" iniative (which aims to improve early identification of children with autism and other developmental disabilities so that they and their families can get the services and support they need) to address the topic in a brand-new episode that will be debuting on Wednesday April 6, 2016. Check your local PBS station's programming schedule to see what time Dinosaur Train is broadcast in your area. 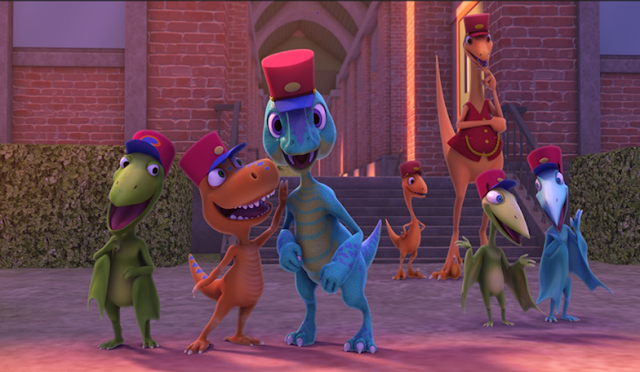 In Dinosaur Train's "Junior Conductors Academy", Buddy and his siblings become friends with a dinosaur named Dennis who knows A LOT MORE about dinosaurs than Buddy does, but he has some trouble making new friends. Like all dinosaurs, their new friend Dennis Deinocheirus has his own dinosaur features. And like all of us, he has strengths in some areas and challenges in others. As Buddy and Dennis develop a friendship at the Dinosaur Train Junior Conductor's Academy, the episode explains Autism in a manner that preschoolers can understand and relate to while underscoring with parents the importance of identifyin children with autism early. In addition to the messaging contained within the "Junior Conductor's Academy" episode of Dinosaur Train, The Jim Henson Company has also released an informational essay from Dr. Stephanie Meyer on the topic titled Learning To Be Curious: Lessons From The Jim Henson Company's Dinosaur Train on PBS. Dr. Meyer, a child psychologist with over 20 years of research and clincial experience served as a consultant on this special Autism focused episode of Dinosaur Train. 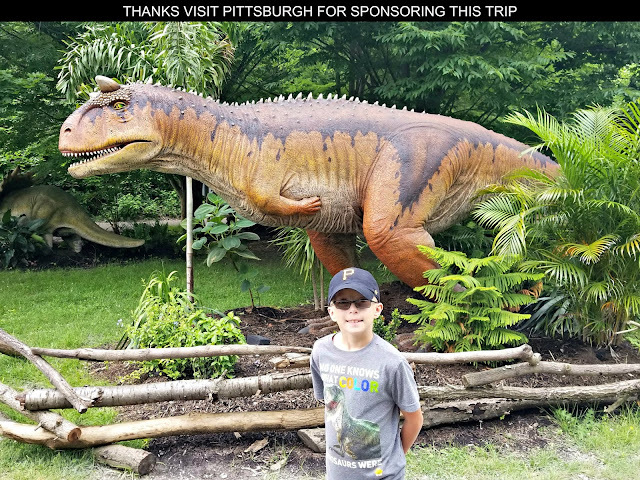 The Jim Henson Company sent us this coloring sheet of Dennis and has asked our A Geek Daddy readers to help introduce the newest member of the Dinosaur Train family to the world. It would be appreciated if families with young children would have their kiddos decorate this Dennis coloring sheet and then tweet out a picture of their art work including @DinosaurTrain and #MeetDennis in the message. As part of its Autism Awareness Month outreach to families with young children, the CDC is also asking parents with children between the ages of 2 and 4 to read AMAZING ME - IT'S BUSY BEING 3 to their kids in that age range. The story is about Joey, an amazing 3 year old kangaroo who is very excited about all that he can do now that he is three. Joey doesn't know it, but these amazing things are called developmental milestones, and that is a very important part of each child's growth. This book highlights for parents what milestones to look for as a child grows and develops plus provides plus provides an opportunity to interact with a child to see if they can do the same things Joey can do. Print out the book below for a hard copy to read or AMAZING ME - IT'S BUSY BEING 3 can also be viewed online or as a free iBook for iPad. I love that PBS is doing this. A family we know has a child with Autism and finding resources like this is always very appreciated. And for me, knowing that my kids can watch educational shows and I don't have to worry about what they are seeing/hearing is terrific! My little girl is crazy about dinosaurs and I bet she would absolutely love this! We will have to tune in! My youngest used to watch this show when it first came out. What a cute program for the little ones. I have a 3-year-old son and he loves Dinosaur Train! It's great to see that they're teaming up to bring more awareness to such an important cause. Sharing this with my day home mommies! Awareness is the key and getting help early can make such a difference in the life of a child. What a fabulous episode! 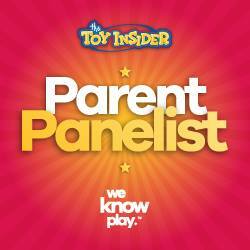 My kids still love Dinosaur Train, so I can't wait to watch this one with them! Great that they highlight and feature Autism Awareness Month. Dinosaur Train is simply special, specially for kids!